I know you look up to me and imagine that all my investments are good ones. Oh, if only that were true. I have had my share of lousy investments, but far-and-away the worst is my investment in a commodities ETF (ticker symbol DJP). My general philosophy with investing is pick a broad index mutual fund. Over half of the Fox portfolio is in a US stock index mutual fund (VTSAX) and an international stock index mutual fund (VTIAX). Yet, back in 2010 Foxy Lady and I made the decision that we should also dabble commodities. Over the past five years, that investment has lost about $40,000. Here is our sad tale. In 2010 Foxy Lady and Stocky Fox engaged in a nuptial extravaganza that Chicagoans still talk about (not really). Now as a married couple, we decided that investing in commodities (after we maxed out our 401k’s, of course) might be a good idea. The financial world was still licking its wounds from the 2008 financial crises so there was still an underlying discomfort with stocks. Plus, the world’s central banks were doing a lot of crazy shenanigans like Quantitative Easing and other things that might lead to major inflation if not handled just right. Finally, commodities had an amazing run up in the previous few year, but then got hammered during the 2008 recession, so they were well off their highs; they seemed like a bargain at the time. Dang!!! Do you see two or three basic invest rules that we broke there? I started doing research on what type of investment would suit our needs. There were some mutual funds out there, but they invested in companies that were related to commodities. Vanguard’s Precious Metals and Mining Fund (VGPMX) was composed of stocks whose companies owned mines and things like that. That didn’t make sense because we already had broad stock mutual funds that probably already invested in those companies. We wanted to own the actual commodity, the actual gold so to speak. There were a lot of ETFs that tracked a specific commodity like oil (ticker symbol, surprisingly, is OIL), natural gas (GAZ), livestock (COW), grains (JJG), and on and on. I liked the sound of that, but I wanted to be really diversified with commodities, so I didn’t want to have to buy 10 or 20 different ones. I kept searching and I found DJP—it seemed like everything I wanted. In a single investment we got a mix of energy, precious metals, industrial metals, livestock, and foodstuffs. We found our winner. It took a day or two to set up our brokerage account with Vanguard, and then we started making monthly investments into DJP. Things started off well. 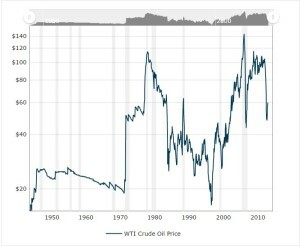 After a year, commodities prices had gone up about 20% or so, and we had made a few thousand dollars on this investment. I was congratulating myself for being a financial genius, and all seemed right in the world. And then the wheels came off. DJP peaked in April 2011 at around $50 and then it began its unrelenting, free fall down to about $30 where it sits today. From a fundamental perspective, it’s easy to see what happened. 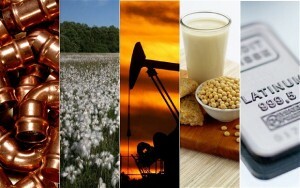 The economy started to slow which curbed the demand for commodities, putting major downward pressure on their prices. At the same time, the fracking revolution happened in the US, unlocking tremendous amounts of oil and natural gas. Those are the two largest components of DJP, and when all that new supply came on line, it just hammered our investment. Keeping faith in “dollar cost averaging” we continued to make our monthly investment all the way through November of 2014. At that point, for tax reasons that aren’t worth getting in to, we stopped continuing to invest, but we still currently hold a pretty decent chunk of DJP. In March 2015 it hit bottom at about $28 and has since rallied to about $30. Small victories, right? That said, we still have a loss on this investment of about $40,000. Why were we so stupid? You heard our tale of woe. So why was Stocky so stupid? Why does he continue to hold this investment when it’s been so bad? First, let’s understand the whole reason to invest in commodities. Unlike stocks, commodities don’t produce anything of value. When you invest in them, you’re just betting that their price goes up. Over the long-term commodities have been a horrible investment compared to stocks (which are companies that actually create something of value). So with all that, why invest in commodities at all? They are really a hedge or “insurance policy” against the double nightmare of inflation and stagnant economic growth—stagflation. If central banks started printing money, inflation would rear its ugly head and the pieces of paper we call dollars and euros and yuans would not be worth as much. However, things like gold or corn or oil or cows would maintain their intrinsic value. But wait a second. Aren’t stocks a good hedge against inflation? After all, they are real assets like property, plant, and equipment. The answer is “yes”. However, the largest portion of a stock’s value is the expectation of future earnings. If the world economy really takes a body blow, stocks are going to lose a lot of value. Look at these two charts—one is for the price of gold and the other is for the price of oil, the two most common investment commodities. They had two major run-ups nearly at identical times, in the late 70s/early 80s and right around the 2008 financial crisis. Those were the two most pessimistic times for stock investing in the past 70 years. 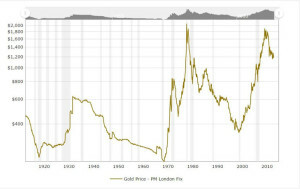 In the 1980s the Cold War was at its peak, OPEC was flexing its muscles, the US economy was crap, interest rates were at 20% and inflation was at 13%. People legitimately thought that capitalism wasn’t going to survive. The best thing to own was real stuff that people valued in the here and now. Similar story with the 2008 financial crisis. The banking system collapsed and it seemed like central banks were just going to wallpaper the world with paper currency. Similarly people thought capitalism might be dead, and similarly the commodities had a tremendous run. In both cases, capitalism did survive and did in fact thrive. Commodities crashed and the world went on. But all this illustrates that commodities do act as a real hedge against the armageddon scenario. Diversification is an unambiguously good thing, so that is why the Foxes hold commodities. Like all insurance, it’s not something you expect to make money on when things are going well, and keep in mind the stock market has done tremendously well since we started investing in commodities in 2010. Rather, you want insurance to be there when everything goes to hell. So that’s our story. As I said, we still hold a small portion of our portfolio in commodities, but it is far and away our worst performing investment. How about you? What was your worst investment? Very honest of you to admit this. That lure of high profits is why Las Vegas survives, I guess.